Omega-3 fatty acids are "good fats" that are essential for optimal health. Omega-3 must be obtained from the diet as it is not produced by the body. 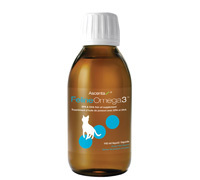 Insufficient omega-3 intake can have a signifcant impact on overall health, and today most dogs have an essential fatty acid (EFA) imbalance as their diets contain too much omega-6 and too little omega-3. An omega-3 to omega-6 imbalance (currently 1:15 instead of the optimal 1:1) results in an increased risk of degenerative disease. One of the most damaging effects of EFA imbalance is the development of chronic inflammation. Clinical research has established a link between chronic inflammation and a broad range of degenerative conditions such as heart disease, cancer, immune dysfunction, arthritis and behavioural disorders. Feline Omega-3 is a quality fish oil with a balanced EPA & DHA ratio making it an ideal supplement for the optimal health and well-being of cats. Suitable for cats of all ages and breeds, Feline Omega-3, in a good-tasting ocean fish flavour, is available in a 140 ml (4.7 fl. oz) liquid. Ingredients: fish oil (sardines, anchovies), vitamin E supplement, rosemary extract, ascorbyl palmitate. Directions: Administer once per day with food according to weight. Store in a cool area, away from light. After opening, refrigerate and consume within 120 days. Keep bottle tightly sealed for freshness. Do not use if the safety seal is broken or missing.